Our TC Kline Racing Spherical Ball Joint Conversion kits for E9X/E82 completely eliminate all rubber in the front and rear suspension for exact control. Designed for race cars in racing series where ball joint conversions are allowed. Upgrade to these M Arms on non-M cars when converting to ball joint. NOTE: On Non-M cars, the rear toe link uses rubber bushings. 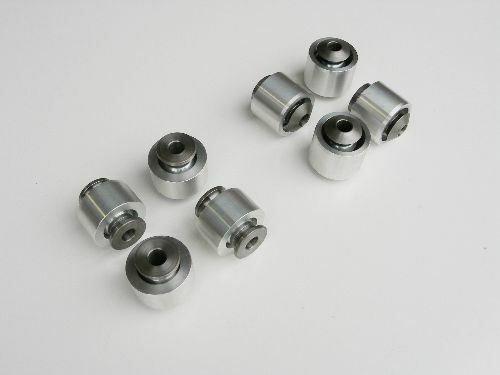 If you want to convert to Ball Joints, then the addition of (4) 25mm housings w/bearings and bushings will be required. E9X M Front Suspension Tension Arms; Left 31 10 2 283 575, Right 31 10 2 283 576 These are slightly longer than non-M.
E9X M Rear Spring Arm; Left 33 32 2 283 885, Right 33 32 2 283 886 Requires longer bolts; Lower Shock Mount 33 52 2 283 638 (2), Outer 33 17 6 760 342 (2), Inner 33 30 2 283 616 (2) These are cast aluminum and use TC Kline Rear shocks: S/A 8241-1200Sport or D/A 8242-1009RSport.